...or Meat Lovers' burgers. But that sounds too Pizza Hut or something. But I suppose they are kind of Pizza Hutty. They're chock full of salty, dried meats, garlic, and parsley and they're totally awesome. I even topped them with freshly roasted tomatoes and put them on a bed of arugula so they're just that much more like pizza. I didn't even think about it's pizza-ness at the time. I was probably too excited at the thought of eating such a conventionally decadent and taboo meal. Pepperoni, bacon, prosciutto, and ground beef. All in the same delicious burger. I do want to encourage you to get quality meats though. 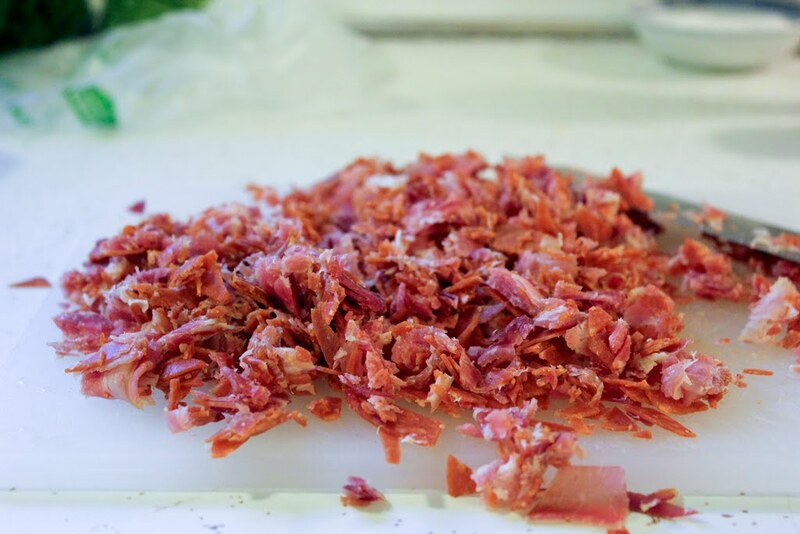 Most of the processed meats you'll find in the grocery store are pretty nasty. If you can, get some uncured, nitrate and nitrite-free stuff. I think most places are carrying stuff like that now, even if you don't have a Whole Foods-type store near you. You know that burgers are my go-to simple weeknight (or lazy weekend) meal. But I still get a little bored with them sometimes. Enter Rachael Ray. She's real unapologetic about liking burgers; each month she features a different, fancy burger recipe in her magazine and she has a whole section on her site just for various burger recipes. I've tried some of them, but I still revert to the usual most times. But I decided to give the latest one a whirl, because it sounded so darn good. And it was. I'd like to take these burgers to an even more ridiculous level. There's a burger at a bar near us that they call The Stupid Burger. It's a whole pound of beef topped with onion rings, BBQ sauce, bacon, cheese, a fried egg, and chili cheese fries. I don't want to go quite down that path, but I think this burger could be elevated by adding a fried egg, sautéed mushrooms, caramelized onions, and maybe some extra bacon on top to boot. I did make it pretty extra great by putting leftover truffled mayo on it. I am a big, big fan of mayo on burgers. 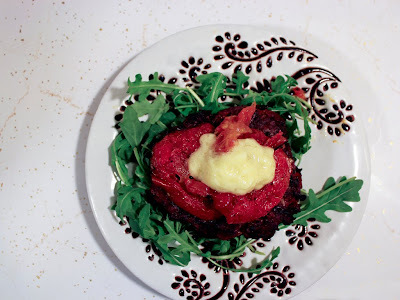 But whatever you choose to put on top, make sure you do indeed try these ridiculous burgers! 1. Pre-heat the oven to 400°F. 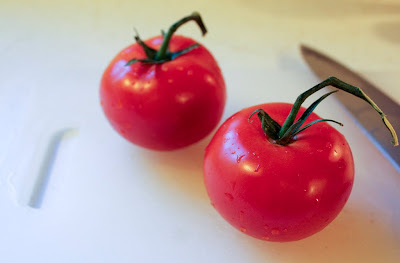 Arrange the tomatoes in a baking dish, preferably in a single layer. My large Pyrex dishes were in the dishwasher and didn't want to hand wash them, so I used a smaller one and had some layered tomato slices. It's okay. Drizzle with olive oil, coarse salt, and pepper. Roast for about 30 - 40 minutes until they're shriveled and slightly browned. 2. 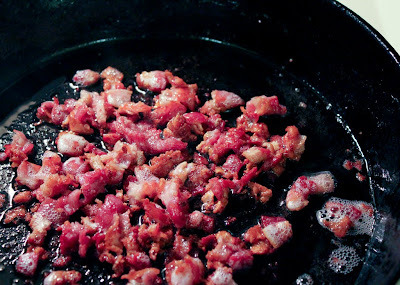 In a medium sized skillet, cook the bacon until slightly browned. Add to a large bowl, let cool slightly. 3. Either with a food processor or by hand, finely chop the prosciutto and pepperoni. 4. Add the beef, garlic, chopped meats, parsley, garlic, and pepper to the large bowl. 5. If grilling, preheat your grill on medium high heat. 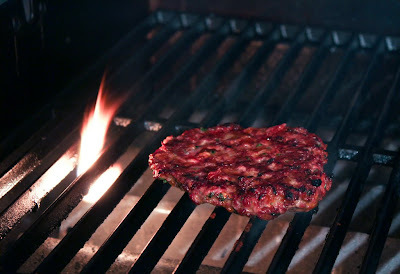 Make four patties, thinner at the center than at the edges for even cooking. Grill or cook in a hot cast iron skillet or grill pan over medium-high heat for about 8 minutes total for medium. 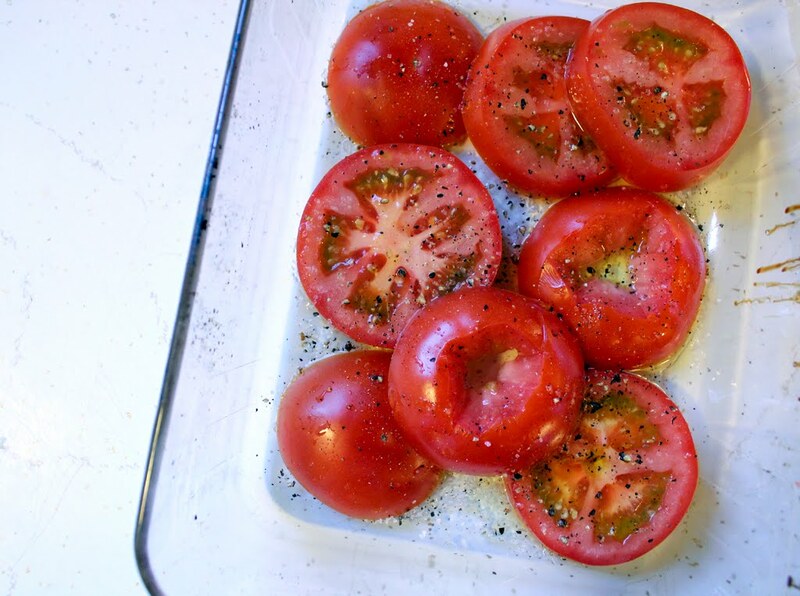 Serve on a big handful of arugula and top with some slices of roasted tomatoes. And perhaps some red onion, avocado... you know the drill.